﻿ Siamese Views Lodge, Bangkok | FROM $29 - SAVE ON AGODA! "Good value for money with breakfast." Have a question for Siamese Views Lodge? "Rooms cleaned daily and water provided in fridge." "We really enjoyed our stay here :)"
"Hotel was great, the location was quiet and the staff were very friendly which was important to me." 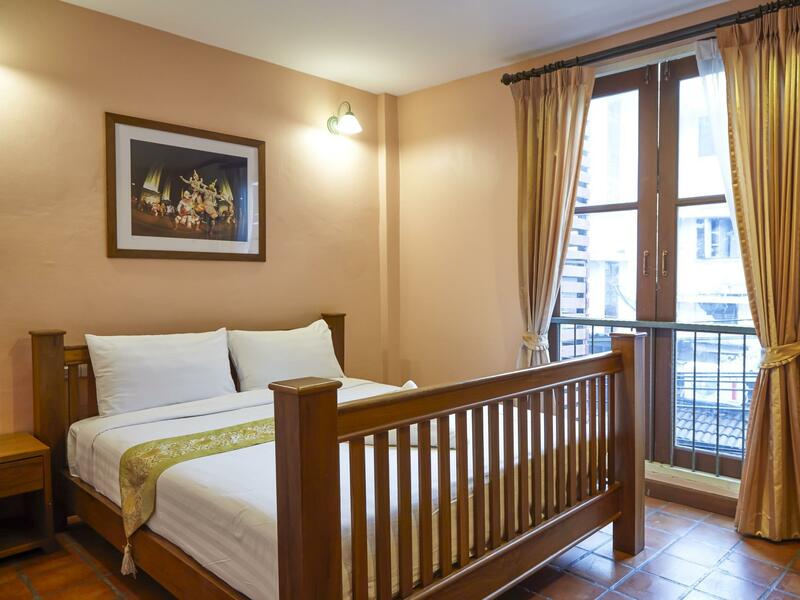 "Clean, comfortable with very pleasant staff"
Located in the heart of the Rattankosin Island, Siamese Views Lodge offers guests a chance to discover the sights of old Bangkok. Walk to the Grand Palace, visit Democracy Monument, and go get some streetside shopping done along the tourist haven of Khaosarn. 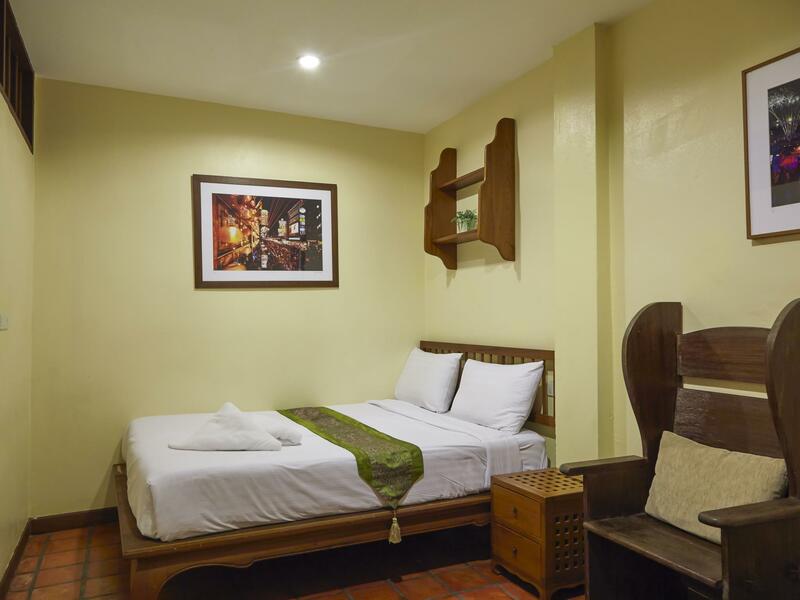 Despite being a lodge, guests enjoy complimentary Wi-Fi access, a mini bar, and an LCD TV. Bicycles are available to rent and make for a fun way to get around and explore the city. Tours are also offered and worth checking out for potentially exciting adventures. 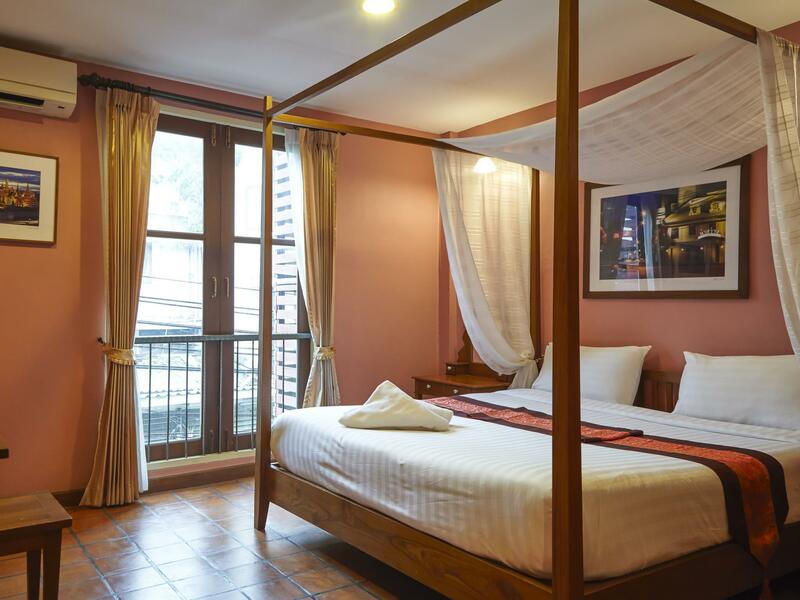 Siamese Views Lodge makes is possible to explore the historical sites of the Thai capital. Please enter your preferred dates of stay and submit our online booking form to make a reservation at Siamese Views Lodge. "The staff is very kind staff, friendly and helpful." Please be informed that late check out between 12:00 pm and 06:00 pm are subject to a 50% room rate charge. For guests checking out after 06:00 pm there will be charged for an additional day (100% of room rate). Also note that guests reaching after 11:00 pm must inform the hotel prior to arrival via email. This is the only hotel I ever was at in Bangkok, and as long as it exists, it will be the only one. The location is amazing, 5 minutes to Khao San, but far enough to get away from the crazy nightlife. Due to it's location it is very quiet, far from the noise of the street. The Grand Palace is within walking distance, as well as the other interests in the old city. The staff is amazing, very friendly and incredibly helpful. The rooms are spacious, and the hotel is very nicely decorated. It gives your stay a homey feel. I can only recommend it if you are looking for authentic Thai lodging! Nice clean room with excellent staff who were friendly and helpful. The location is in within walking distance to some major temples and museums. This is good value for money. But if this is your first time come to Bangkok, so make sure you look at a map and know where you're going (our taxi driver didn't). The location of the hotel was a 5-10 minutes walk from the backpackers' attraction spot, Khao-San Road. I definately enjoyed my stay there due to the cleanliness of the hotel and also very accommodating staff there. There is a Mcdonalds that is opened 24 hours nearby the hotel and also a sidewalk cafe that serves local and western food which made it convenient when we got hungry in the middle of the night. The room was in excellent condition,extremely clean and had a cosy feel to it. Overall, it was an enjoyable stay and i would definitely go back there if i were travelling to Khao San again. fairly standard/nice place. no shower curtain, but enough room. location is very difficult to find if you don't have a map or gps. i found it easily with my iphone gps and precached maps. no taxi drivers have any idea where this place is!!! once you find it... it is not that central. 10 minute walk from khao san. which was fine for me though. great service, clean rooms. A very nice place in the heart of Greater Bangkok. The hotel location is simply perfect. 10 minutes walk from Khaosan road, but far from the noise. The staff is very friendly and very fair with customers. We had reservation without breakfast, but because they had a promotion during our stay, we were also included and got free breakfast every morning. The hotel is nicely decorated, with a good book collection, nice furniture that gives you a very familial feel. All sightseeing we did, we did by foot. All major sights are within a walking distance. Also a very nice restaurant just on the street corner, with a great view of the Democracy Monument. I stay this hotel from time to time about 6 years. Great location, extremely friendly staff and cool atmosphere is still in place. The only think i can say contra - rooms need refreshing, it doesn't mean something bad in the rooms, but i just remember how i was some years ago. Fantastic location! 10 mins walk to Khao San and Rambuttri roads (Rambuttri far nicer, especially the far end next to the temple). Also 10 mins walk to Golden Mount and the water taxi (6bht) which takes you to Jim Thompsons House and the central Siam Square. Its only a 20 min walk to the Grand Palace. Very near all the action, but extremely quiet and the staff are lovely!! You can't go wrong! Thanks everyone!! Hotel was great, the location was quiet and the staff were very friendly which was important to me. The rooms were clean and I found the bed hard yet comfortable and I slept well. The bathroom was clean but the shower was a bit basic with no separation with the rest of the bathroom. The only small ding I can give is that the room was not equipped with a safe so you have to leave your valuables at the reception. We had a really good Time at Siamese View Lodges. The girls there are so kind a helpful. The told us how to get to different places, how much a Taxi/TuK TuK should cost, so we wont get screwed by the drivers and much more. Also they loved our 2 year old kid. The breakfast was good, too and the rooms were clean. We would definately stay there again. This was a very lovely introduction to Bangkok. Being our first time to Thailand, we wanted a location that was central yet quiet, as we needed time to recover from a long flight. We arrived past midnight, and were greeted by a very kind staff member. She gave us the choice of our room, warned of several things to be aware of in the area when sight seeing, and setup everything for us so perfectly. It put these weary traveler hearts to rest. The accommodations were good, the breakfast was nice, and the service and staff were simply kind and courteous, knowledgable and sweet. Very great decor in the traditional Thai style, and located on a quiet street walking distance to all the local attractions. We would certainly recommend and stay here again! It was good. 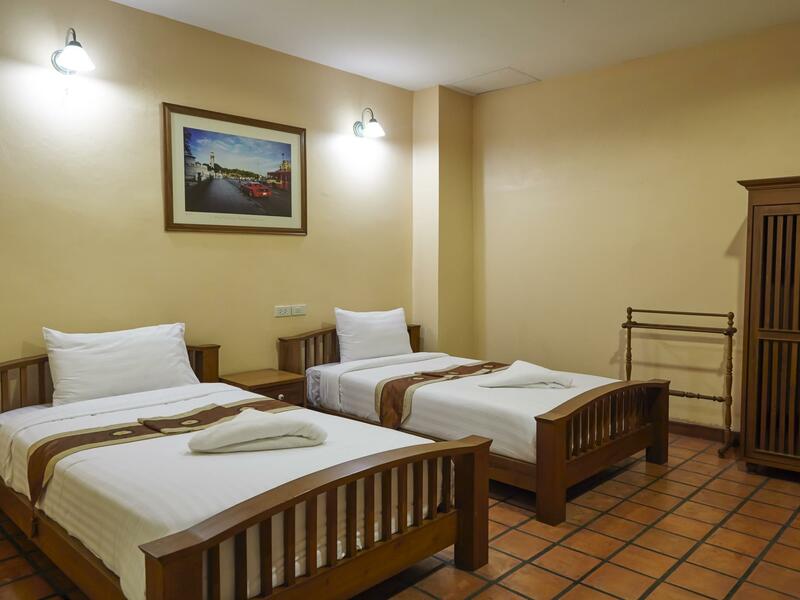 Staff Performance is great, the location is quite good as it is 5-8 mins walk from Khao San Road which is too crowded but the hotel room is quite old and the bed is not that comfortable, also the toilet is not well maintain. I would say the per night charge is quite expensive that the overall service that we are getting. The staff was tremendous during check in at 2:00 am, and even more on check out, waving taxis for us in the rain on the street during rush hour (as none would come when they tried by phone). We could have missed our train if not for the tuktuk they managed to get for us eventually. Hotel is very clean and pleasant. Location not pretty nor too bad, 3 min walk from Khaosan. Mattresses too hard for our taste. Slept and missed breakfast. Loved it. We got one of the cheaper rooms with no windows as we were travelling but that was ok as you get done light from the hall. The staff are amazing and help you with everything. One even came out with us and got us a taxi to the airport and made sure it would be on the meter! We stayed for the first day of Songkran and it's a perfect location. 5 min walk to the thick of it but you can escape to the hotel when u need a break. We followed a review about finding it which was so helpful: Face Mcdonalds by democracy monument - look right, cross the little road and walk past the restaurant on your left. There is an alley/street on the left just after the restaurant and it's down there on the left. Thank you to whoever the guy was that posted that review as it saved us when we arrived in the middle of a freak rain downpour! Got us there quickly. Songkran us crazy and you will get completely drenched so a dry bag is a good idea and they sell little wallets for phone and money along the way for 30 baht. May want to arm yourself with a water pistol too Thanks Siamese lodge for a great stay. We'll be back! the staff was great, the rooms were comfortable and the cat at the door step and the white scottie at the top of the stairs were adorable. We enjoyed the location away but close to the activities of Kao San and how it is neatly tucked away from the traffic of Democracy Monument. The staff are warm and professional and helpful and the decor is pleasant and comfortable. Great value for the money. The Good: The service is superb. The room size is comfortable and worth the price we paid. It is 1 km walking distance to Khaosan so not that bad at all. The Bad: An air-condition in one of the rooms kept making noise. One thing that I really do not like is that the smoking area is right in front of guest room. It should be outside of the building! Helpful staff, good location and comfy beds. It was upon arrival, the attentive of the staff that impressed me. I arrived at the hotel way too early(8am)for check in but the staff actually draw out a detail map and guide to help me get around Bangkok's major site seeing spots to keep me occupied until its time to check in. Its location is great if u are at Bangkok for site seeing rather than shopping. 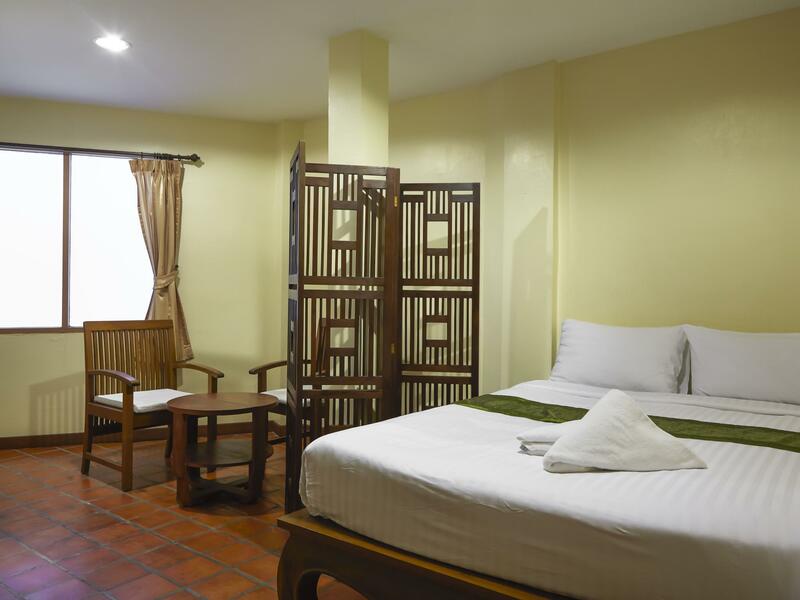 Its walking distance to Khao San Road and walking to the Grand Palace & Wat Arun is a comfortable distance. Only verdict is that I would suggest the hotel room to be more furnished. I sometimes find myself needing more surface to put my things. But other than that it was a great stay. 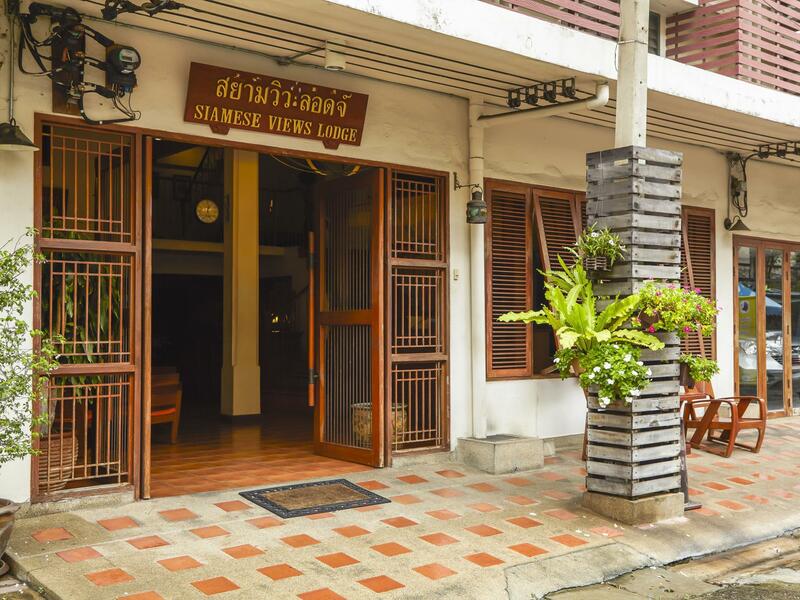 The staff at Siamese Views Lodge is very helpful, very friendly, and always willing to help with directions to various destinations within Bangkok. There is a comforting feeling of staying at the hotel, like you are at home in a foreign land. If I visit Bangkok sometime in the future, I would seriously consider booking here again! Great spot to stay quiet little street but close to everything just 5 mins walk to Khao San Road where you have everything you need. about a 10-15 min walk to palace and the giant buddha only 10 mins walk from river for the ferry which will get you everywhere for very little money.